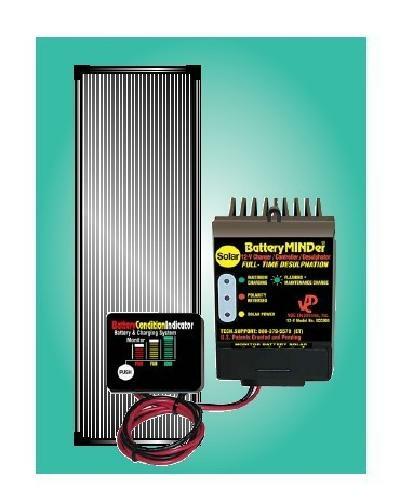 This 12 Volt Solar BatteryMINDer allows you to charge from 2 to 6 batteries (parallel or series connected) at a time. The batteries can be the same or different type (starter, deep cycle, sealed gel, AGM, etc.). The voltage (12 Volt), the resting voltage (minimum of 10.5 volts), Amp and the condition of batteries must be the same if you charge more than one battery at the same time. This BatteryMINDer provides full-time desulphation in all modes. The unit comes with a Battery Condition Indicator that has a push button for testing the condition of the battery. 15 watt amorphous silicon solar panel. Dissolves power robbing sulphation and prevents new sulphation (caused by self-discharge). Meets exact maintenance float charge rate of all major sealed, dry-type battery makers. Prevents permanent cell damage due to self-discharge. Supplies exact voltage and current required – never more. Temperature short circuit and polarity reversal protected. * Actual current output is determined by individual battery demand. When you purchase BatteryMINDer model SCC015 (12 Volt), VDC will send you a FREE SureGuard* for the price of shipping and handling ($5.95) if you fill out and mail your registration card. SureGuard displays the condition of your battery and charging system instantly!